As with all these buying ideas, it came to me late in the working day. 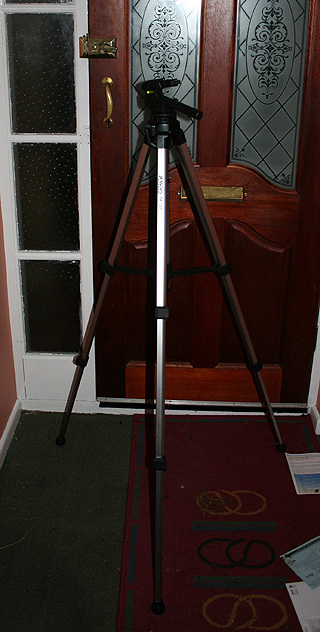 A trip to the local Jessops soon sorted me out with a reasonable tripod for a reasonable cost. About 30 quid in fact. This will be handy for holding the camera steading taking pictures of all those small telescope parts! Using a tripod I can utilise much longer exposures, and therefore use a much narrower aperture, giving more depth of field. This is very useful when taking closeup pictures of astrophotography equipment. I will use my new tripod in conjunction with my remote shutter release. This helps me to fire the shutter without touching the camera - touching your canon 350D whilst taking an exposure will allow camera shake to creep in and ruin things. Another clever thing that the 350D canon DSLR does to reduce vibration is Mirror Lock. In the custom functions of the camera, you can program a mirror lock. When you press the shutter button the first time, it locks the reflex mirror out of place, on the second press of the shutter button it actually fires the shutter curtain and takes the picture. Using a tripod, remote release and mirror lock allows nice long shutters to be used. These techniques are all vital for astrophotography as well as terrestial photography. I will be learning more about this sort of thing once I get this camera onto my telescope!